Weinberg junior Joji Syed (left) speaks at the debate. Syed faces SESP junior Christina Cilento in the presidential race. Voting begins Thursday at 5 p.m. Candidates for Associated Student Government president and executive vice president squared off in their first debate Monday night, disagreeing on how central helping marginalized students should be to their platforms. 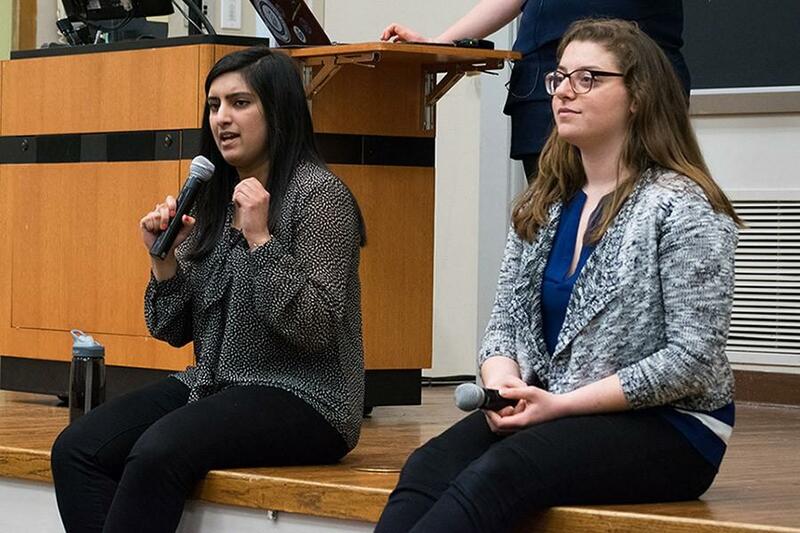 Presidential candidate Christina Cilento and McCormick junior Macs Vinson, her running mate, said their platform focuses chiefly on marginalized students, while presidential candidate Joji Syed and Weinberg sophomore Archit Baskaran, her running mate, said their platform focuses on projects that would serve all Northwestern students, including marginalized ones. The debate, which was attended by more than 50 students, was held in Fisk 217. Cilento, a SESP junior, said viewing every problem on campus through the lens of aiding marginalized students is the core of her campaign, and some of the other ticket’s proposals — such as streamlining the Student Organization Finance Office — were less pressing. But Syed, who is Pakistani and Muslim, said her and Baskaran’s experiences as marginalized students contributed to their platform and gave her a “holistic perspective” when choosing social justice, alcohol policy reform and mental health as their main focuses. After the debate, SESP freshman Ben Powell, who he works for Cilento and Vinson’s campaign, said the ticket’s platform is especially important for freshmen. On the other side, SESP sophomore Josh O’Neil is a campaign manager for Syed and Baskaran. He told The Daily he liked all candidates’ answers, but he appreciated Syed’s multi-issue platform. There will be two more debates before voting opens. Coalition of Colors — a collective of identity-based student groups — will host a debate Tuesday at 8 p.m. in Fisk 217, and The Daily will host a debate Wednesday at 8:30 p.m. in McCormick Auditorium. Voting will begin online Thursday at 5 p.m. and will be open for 24 hours.